When you think of the Netherlands, so many iconic things come to mind. 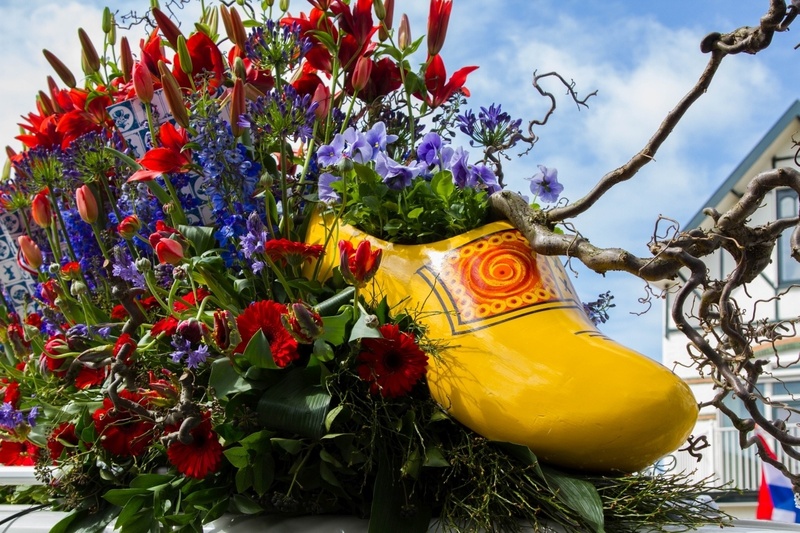 There are wooden shoes, tulips, windmills, and bikes! 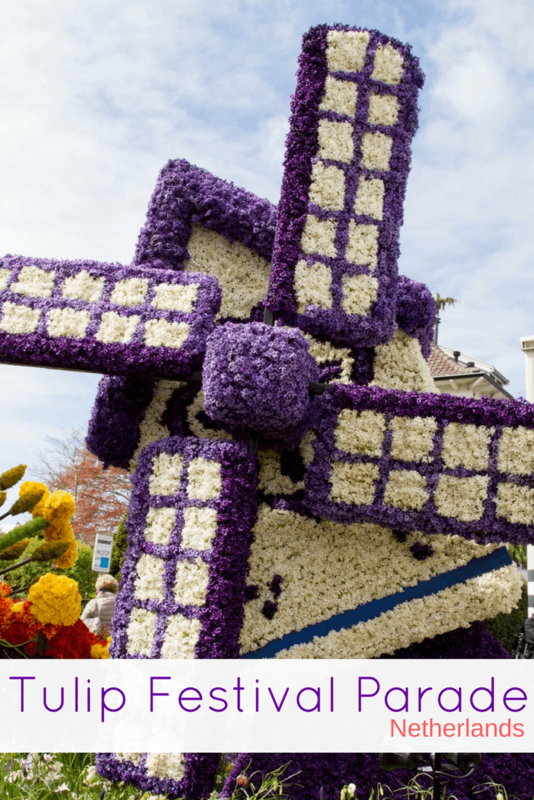 The annual tulip festival and flower parade highlights everything Dutch as well as floats and costumes to follow the yearly theme. To experience Dutch Tulip Season, you definitely won’t want to miss this spectacle, for a quick taste of the sights and sounds, check out our video, here. 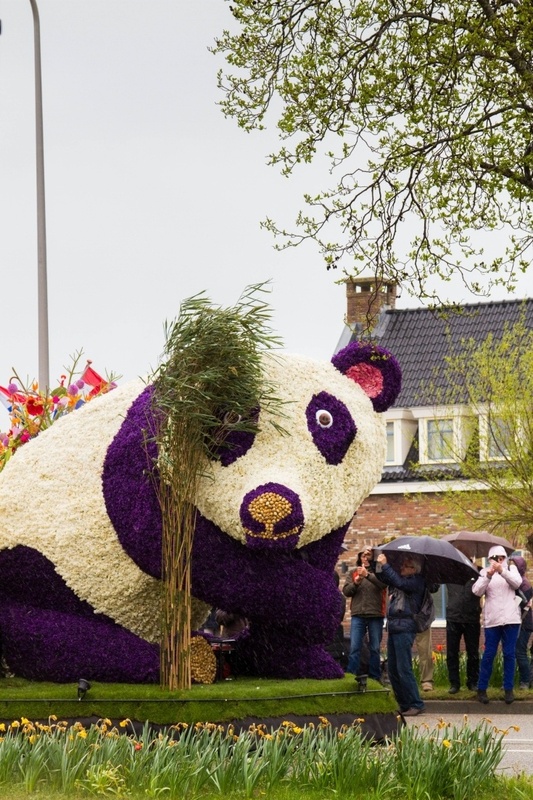 The Bloemencorso (flower parade) is usually held around the third Saturday of April, and the route is almost 30 kilometers long, stretching through 10 towns. These towns all produce giant flower floats that hundreds of volunteers have worked on during the 2-3 days prior. 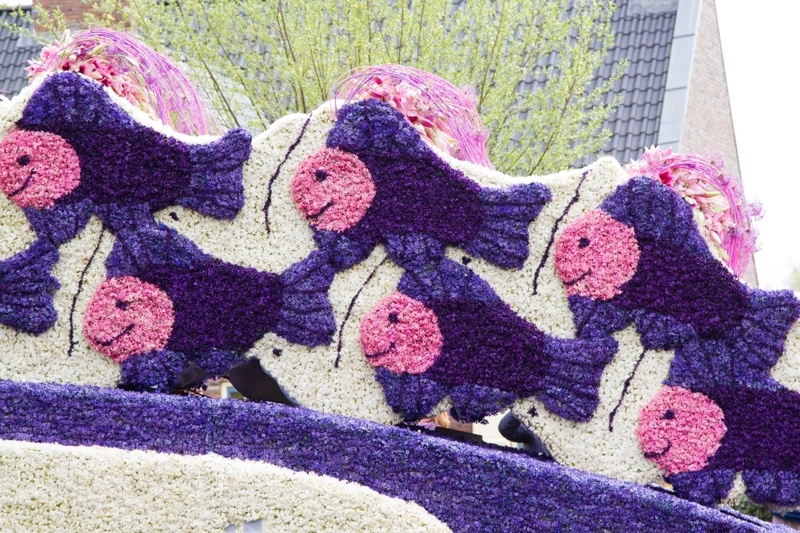 In the past each town held their own small flower parade, but so much work goes into the parade floats that now it is just one massive flower river winding through the main flower region of the Netherlands. There are so many advantages for us visitors doing it this way. To begin with, the route is so long that there is plenty of room for everyone to have a great view. There are whole gaps of road where the parade passes through that have no one standing there. In saying that, however, there are still plenty of people and some towns get very crowded. Probably the most crowded place to watch the parade is near Keukenhof Gardens. 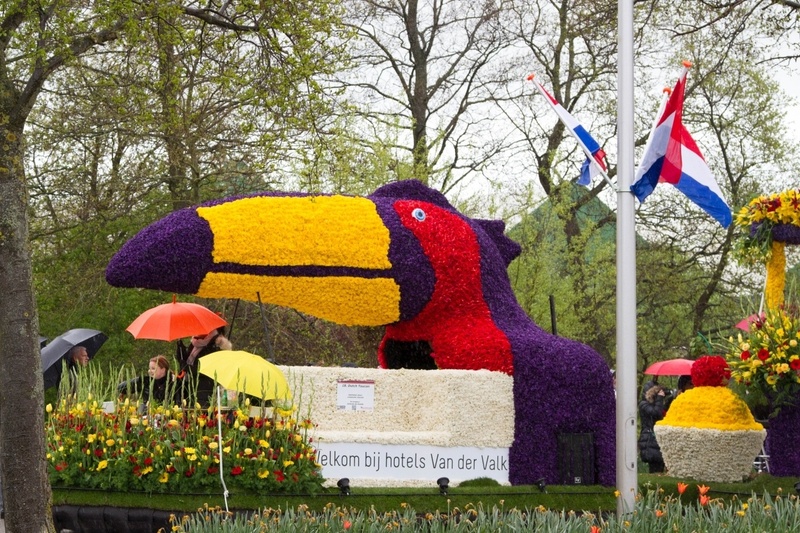 The flower parade reaches this Dutch landmark at about 3:00 PM. Personally I wouldn’t watch the parade from this point, since there are plenty other places that are much less crowded. Pin the Tulip Festival for your planning! 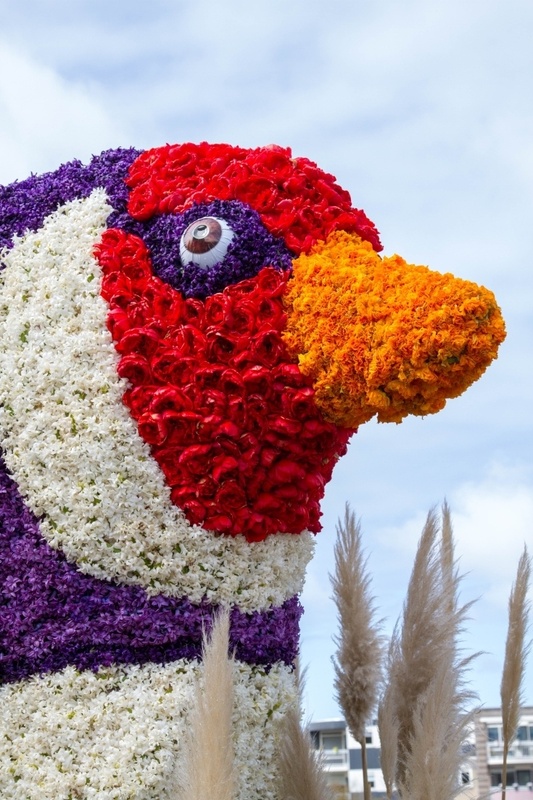 The parade floats, complete with giant flowers, giant bikes, giant birds and exotic animals all line up the night before the bloemencorso in the center of Noordwijk where they are illuminated in the evening. This might be one of the best places to view the parade floats up close without too many people around. If you get a hotel in Noordwijk, you can see the illumination, as well as get up in the morning and see the parade begin. The procession begins promptly at 9:30, it’s not too early so you have plenty of time that morning to get some good photos as they are preparing or go stake out a fantastic vantage point somewhere along the route. 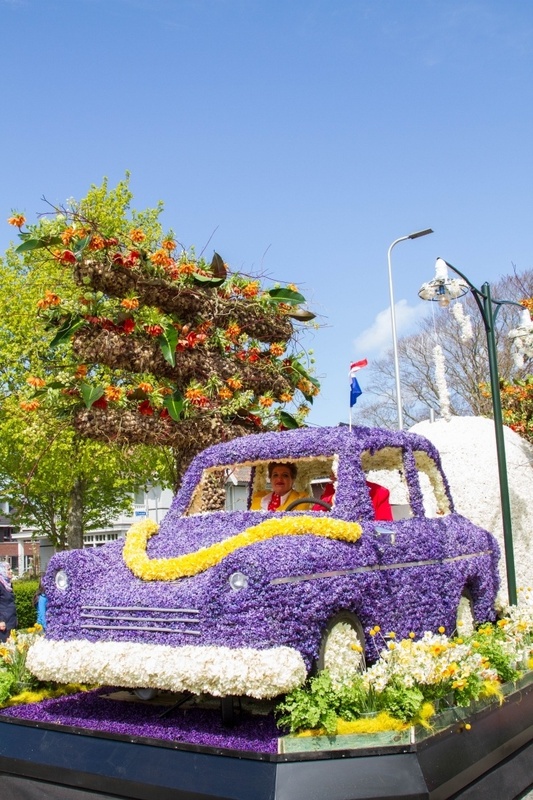 After viewing the parade, then go to Keukenhof Gardens where you can just enjoy the exhibits without fighting the crowds who will line up for the parade in the afternoon. 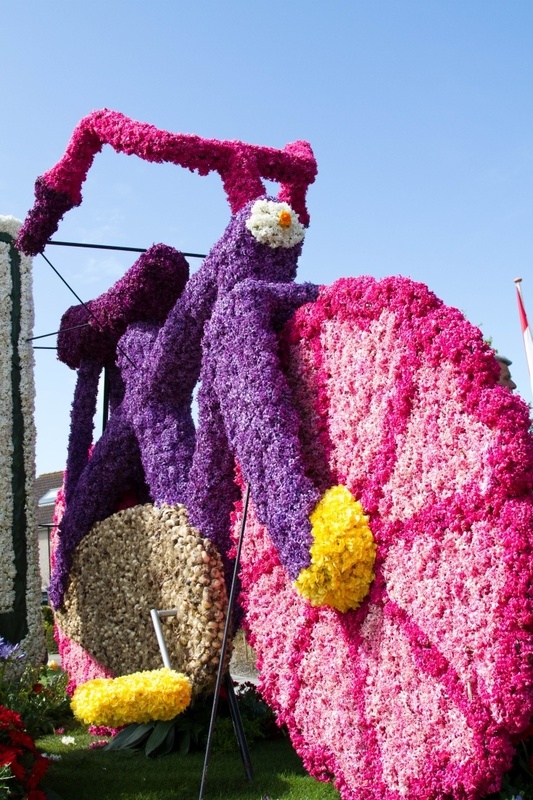 There is one set of grandstands set up for people to watch the bloemencorso in the town of Sassenheim. Dutch weather can be extremely predictable in April. There is going to be sun and rain, rain and sun, usually within the same 24 hours. These intermittent bouts of sun and rain will also be accompanied by a strong breeze as well. The grandstands (cost 25 Euros per person) provide you shade from the sun, shelter from the rain, and certainly reduce the wind. The town also provides some music entertainment the half hour before the flower parade begins, which loosens up the crowd around you helping to make some new friends. They also include a free coffee when you enter to keep you nice and warm. However, the biggest benefit of buying a grandstand ticket is that there are marshals making sure that no one obstructs the viewers since they paid for their ticket, supporting the show. Sassenheim is, therefore, probably my next pick as the best place to watch the parade. There are some great hotels here; we stayed at the Van der Valk Sassenheim, which was a short 5 minute walk to the grandstand and right on the parade route. Another good reason to make this your flower parade viewing spot is that the parade also stops in Sassenheim for lunch, so after the procession is finished, you can wander among the parade floats to get some really great photos. 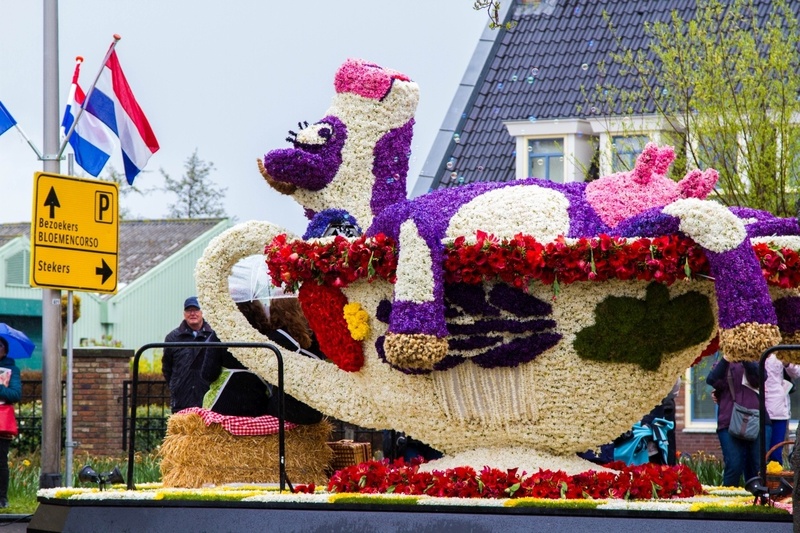 This float with the Dutch cows luxuriating in a cup of tea was my favorite of the parade for a couple of reasons. Remember those friends we met while listening to the music in the grandstand? Well, the one lady was one of the volunteers who’d worked on this float. 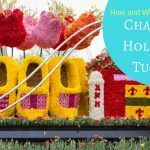 The Netherlands is most known for her tulips, but if you look closely at the floats they are made up of chrysanthemum petals. However there are many varieties of flowers used to accentuate the design, like using the tulip bulbs for the cows’ hooves. This particular parade float had over 200 volunteers working for three full days, while the flowers were still fresh. Our friend showed us pictures of the entire process. First the float is designed, then a base of wood, Styrofoam, and wire make the shape of the characters and items, then the volunteers follow the pattern by taking a straight pin and pinning the flowers to the frame. It’s an amazing feat! Like all parades, unless you shell out the money to sit in the grandstand, it is free. 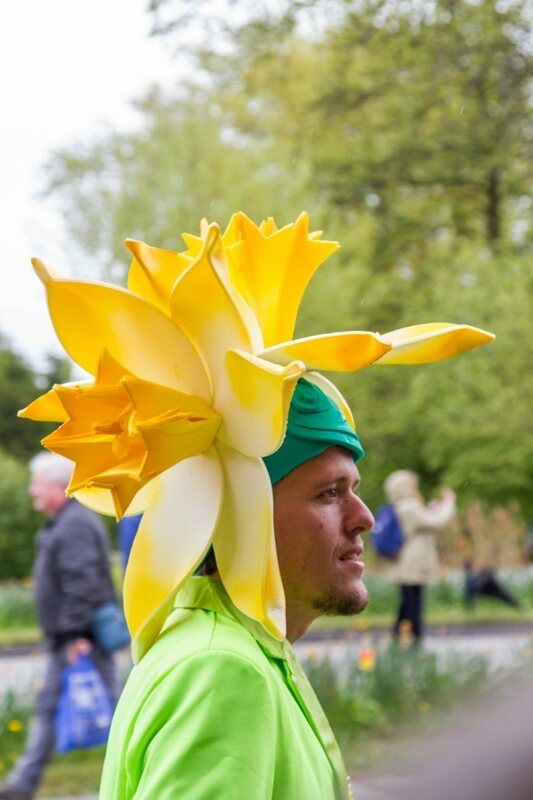 However, there are these volunteers, dressed up like various Dutch flowers, that wander through the crowd collecting donations to help defray the costs of these amazing floats. Our Dutch friend said one Euro is the perfect donation, and as the collectors walked through the crowds, they would jingle their bags. There was no pressure, but what a great way of giving back. Not all the vehicles were turned into parade floats, there were many cars, trucks, buses, and even tractors that were laden with the most beautiful bouquets of flowers. 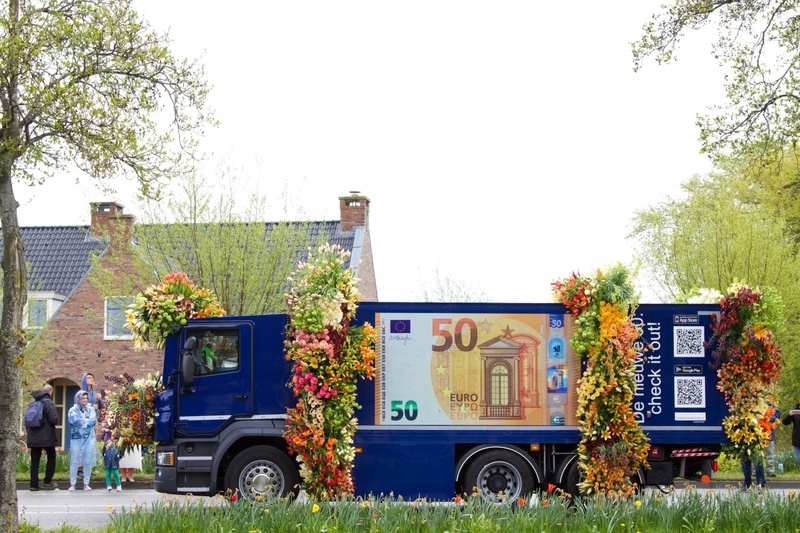 The truck above is celebrating the new 50 Euro bill, and the ambulance below was a chase car to help if anyone became ill or injured. Everyone, every vehicle gets in the spirit! 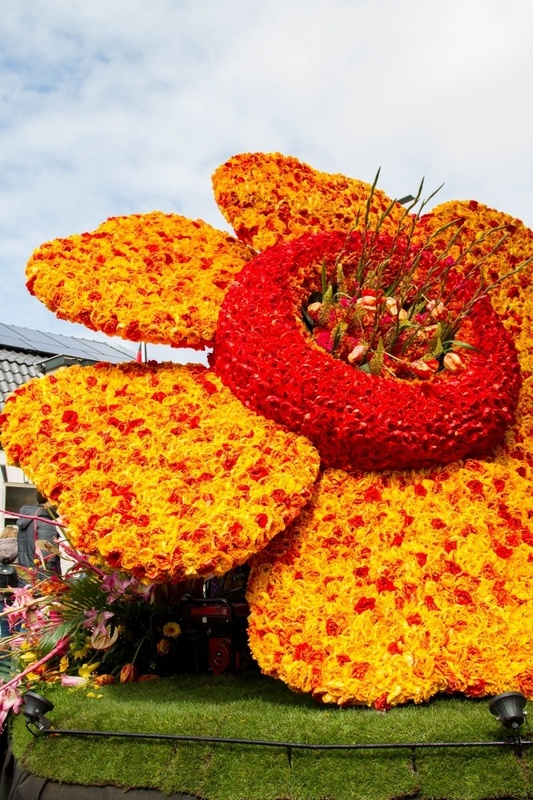 The Bloemencorso is definitely one of the best events in the Netherlands, and I would highly recommend you include it on your itinerary if you intend to visit. 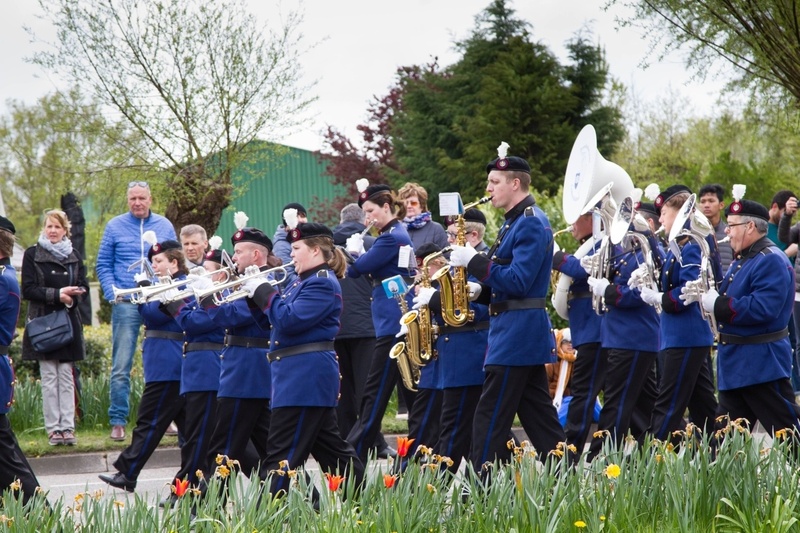 Below are a few more images from the flower parade. Which one is your favorite? 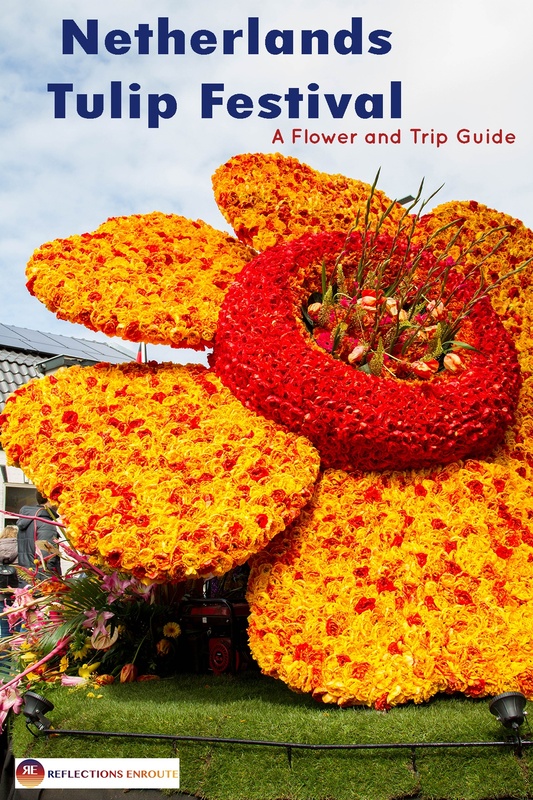 The flower parade route may change a little each year, so it’s a good idea to check it before you come. 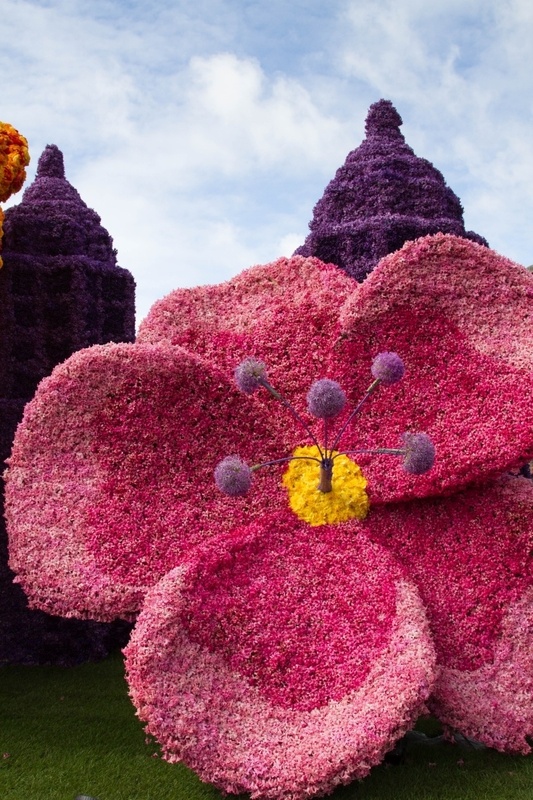 You can find out everything you need to know about the Bloemcorso at their website, here. 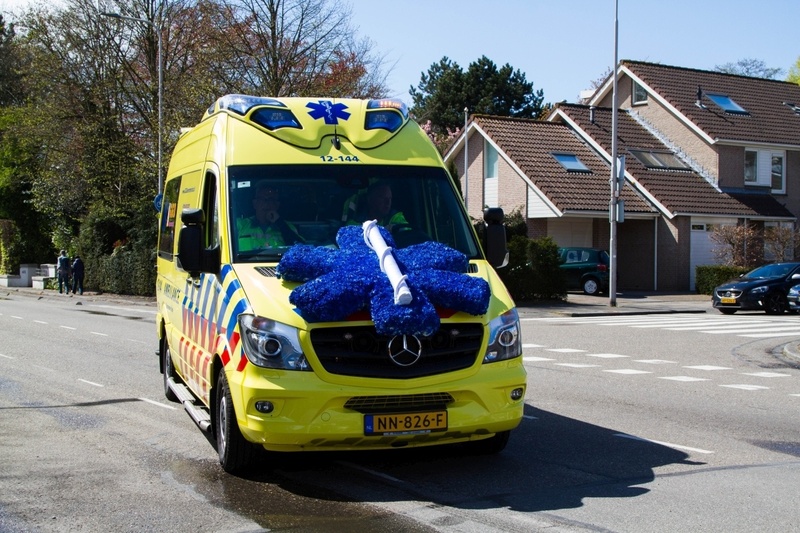 You can plan to stay in or around these towns as the parade will definitely visit them at some point during the day: Noordwijk, Voorhout, Sassenheim, Herstart. 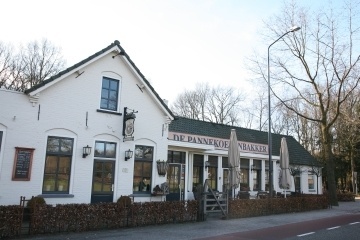 Lisse, Hillegom, Bennebroek, Heemstede, and Haarlem. 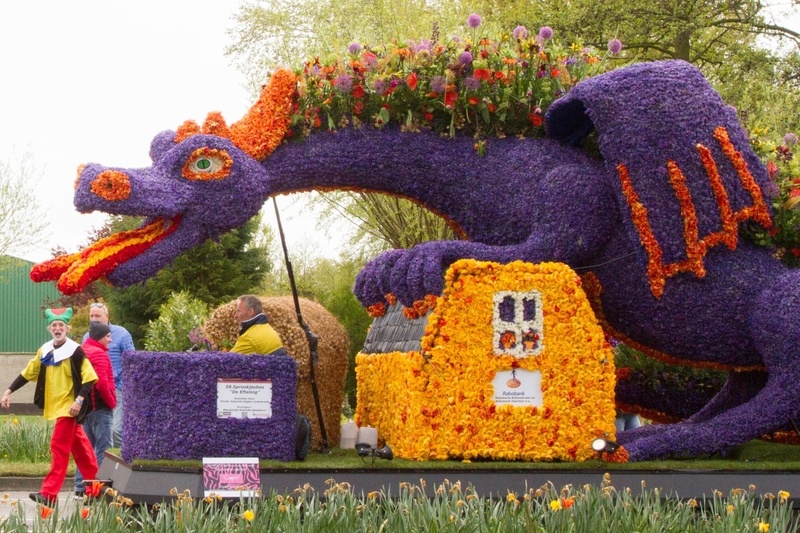 As I mentioned, Keukenhof Gardens is one of the venues, and that is in the town of Lisse. Cost: Grandstand tickets are 25 Euros each and you can buy them online along with parking tickets. You don’t have to necessarily pay for parking if you leave your car at your hotel or find a lucky spot, but the parking areas are very close to the parade route and it costs 5 Euros per day. There are plenty of parade marshals out directing traffic, so you won’t have to worry about setting a parking area in your GPS. What to bring and wear: It’s a parade with plenty of room, so if you can bring a folding chair or blanket to sit on it’s a good idea. Don’t forget to bring an umbrella, and wear a waterproof jacket. Dress in layers as the weather will probably change frequently. What to eat: Luckily you don’t have to spend a lot of money to eat great Dutch food. Probably their most well-known dish is pancakes. Unlike American pancakes you eat them savory with a vast amount of choices for toppings. We love the bacon and cheese. There are also sweet pancakes covered with fruit, ice cream, and whipped cream which are delicious, but I recommend you try the savory or share with someone one of each. Pin the Netherlands Flower Parade for later! I love this! I moved to the Netherlands 1.5 years ago but somehow didn’t find out about this until it was over, and this is my first time seeing photos from the event… It’s definitely on my list for next year! Tendelle, You will love it. It’s fun and well-executed as well as so creative and colorful. Thank you for writing this. If I have little time in the Netherlands – is this a must do? Virginia, I do think it’s a must-see, but you have to go in April. That looks like such an amazing celebration! Ive been in Holland so many times but I never seen those amazing tulips! Ada, You should definitely try to see them the next time you go! I cannot believe they make those floats with real flowers!! This reminds me of the movie, be movie I think it’s called. I have kids and live in Barcelona, so Getting there in April will be hard. Amy, Getting anywhere in April can be difficult, but it’s a weekend so that might help. Wow! Those floats are amazing. I bet the air smelled wonderful! The flowers were beautiful and smelled great as well. The whole day was just perfect. What?! 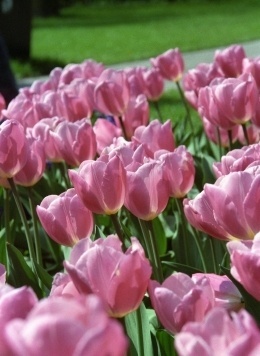 There’s a tulip festival in Kashmir? I will have to look that one up! Glad you found it. Go next year! You will love it. Wow..this is amazing. Those floats are so beautiful and such works of art. They remind me a lot of the Rose parade floats here in Pasadena. This one seems so much more festive though. All those float photos just brightened my day. Mary, I have never been to the Rose parade, but I’ll get there someday. The floats are pretty impressive! If you happen to be planning a trip to Holland, go and see it.